Nonfiction Editor Dustin Deil conducted this interview with Tania Katan. Superstition Review: Your one-woman show, Saving Tania's Privates, has become almost as well known as your memoir, My One-Night Stand with Cancer. Could you explain the process of taking your writing and translating it into performance (a process not too many writers are familiar with)? 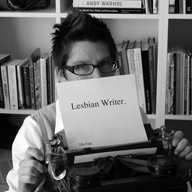 Tania Katan: I started my writing career as a playwright. I feel pretty adept at writing dialogue and monologue and inciting incidents and all of that stuff, so when it came to writing my book, well, that was more of a challenge. I remember turning the first draft of my manuscript in to my editor and she said, “It reads like a monologue.” So of course I was thrilled, until she reminded me that I was writing a book not a play. I wrote the book as if I were having coffee with a good friend, my part of the dialogue, very conversational, as if this friend/reader might respond. So thinking of the book as a monologue, not a soliloquy, but half of a dialogue and having that energetic exchange with a live audience felt natural and necessary. SR: For authors who typically do not perform their work as you do, what advice would you give them? What are the pros and cons of performing one's work? TK: Anytime an author reads her/his work aloud, they are performing. So, please, authors, practice reading. A lot. In front of people who aren't your family or friends. Watch other writers read their work and note why you like it. Work with a director. Practice some more. Practice until you can feel the words in your mouth and in your body. Understand what you are reading. Respect your audience. If you understand what you are reading and why it's important, then your audience will too. And practice some more. SR: You have an annual writing workshop at Castello di Spannocchia in Italy. Why did you choose this particular location? How does this location change the workshop dynamic? TK: First of all, Tenuta di Spannocchia is 1200 acres in Tuscany full of rolling hills, grapes, olive trees, well preserved castles, culinary delights, and the most amazing energy of anywhere we've ever been in the world! We had to apply to teach at Spannocchia, because they offer limited workshops that must fit with their mission.The mission of Spannocchia is to encourage global dialogue about sustaining cultural landscapes for future generations. Two Little Wishbones is passionate about sustaining cultural landscapes through recording our current and past histories in the forms of memoir writing and drawing; actively engaging with the earth by walking and breathing consciously, and providing our students with the tools they need to integrate art in their everyday lives. We feel strongly that our form of creative sustainability compliments the mission of Spannocchia. SR: You often refer to yourself as “breast cancer survivor, author, performer, and marathon runner;” however, you are also a very influential queer writer. What role does sexuality play in your identification as a writer? TK: Please see attached photo. It's sort of why I don't go to gay pride events as often as some. Sure, I'm gay and proud, but, like every God-lovin' second of everyday, so going to a sanctioned gay pride event seems a bit redundtant. The queer part of my identity has been so visually evident for so long, not to mention the fact that my activism and writing are so specifically queer, that the other parts are a bit less evident: runner, performer, breast cancer survivor, those are a little trickier to identify. My sexual identity, along with other ways in which I identify, are mostly used as ways to tell other people who may have similar needs/desires/interests (or not), that I'm coming to a bookstore or theatre near them. Personally, I identify as a puppy, but have found that few puppies come to my readings and performances no matter how much I spread the word. SR: You do a lot of workshop and writing classes. Could you comment on some of the benefits that you experience, as a writer, by being involved in this capacity? TK: I love teaching people how to write just as much as I love writing. I've got a knack for finding themes and showing people how to connect them. Giving a critique is like running for me; there's a focus and movement and out of breath quality to exposing the entire world of an essay or play so that a participant can start to see the bigger picture and feel empowered to fill in the blanks. SR: What is the most important message you hope to leave your workshop attendees? What have you been able to take away, personally, from your workshops? TK: Writing is a practice, like running, like breathing, like being. Everyone can write as long as they know their audience; whether they are writing for their family, publication, a break-up letter; they must know specifically whom they are addressing in order to make their writing clear and vibrant. SR: How did you come to write for The Advocate and what role has this played in your writing overall? TK: Anne Stockwell. She's the coolest ever. She brought me into the fold. SR: When writing for the stage, what are some of the limitations you experience, compared to writing non-fiction? What are some of the freedoms? TK: No limits. No limits on stage, no limits on the page. Writing only has limits when we're thinking about selling it, which has no place in writing, but creeps in sometimes anyway.